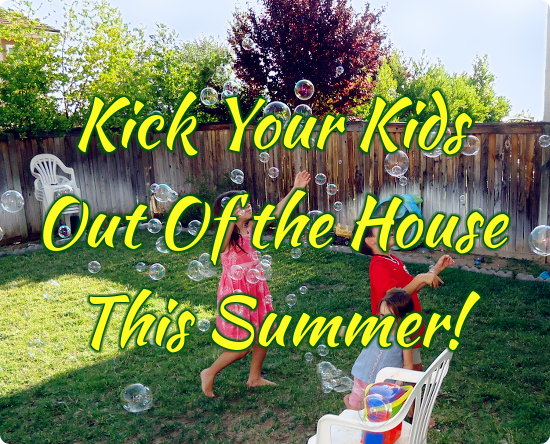 Kick Your Kids Out Of The House This Summer! How much do your kids grumble about having nothing to do now that school’s out, especially when you tell them to shut the screens off? There’s a simple solution to that – make them go play outside. Think about your own childhood and how much time you probably spent outside playing. Doing much the same will be good for your kids too. Have them dress appropriately and wear sunscreen as necessary, but get them outside. Here are some ideas to help them be happy about it if they aren’t sure what to do. What kid doesn’t love a good water fight? Set up rules if the kids can’t agree on their own, but let them try it their own way first – parents don’t have to set up rules all the time. If you have a kid who tends to squirt everyone else right in the face or otherwise do things that might hurt someone or are just plain annoying, that’s one thing, but many kids can handle making their own rules – sometimes that’s part of the fun! If you have a good sidewalk, clear driveway or patio, sidewalk chalk is a lot of fun for kids. Even my oldest enjoys it some days still. Play Tag/Hide & Go Seek, etc. A good game of tag gets the kids running and having fun. You may even be able to get some neighborhood kids in on the fun, just make sure all are agreed upon the rules, especially how to handle the street. 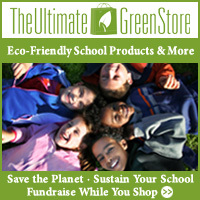 Send your kids out to ride bikes, with as much range as you think appropriate for their ages. Ride with them if you want, but remember that it’s good for kids to develop independence at appropriate ages. Time to water the lawn? Send the kids out to enjoy it if you water late enough in the day. Have the kids look for things you know they’ll find in your area outside. If you include bugs on the list, make sure the kids don’t hurt them, and release them at the end, especially if it’s a beneficial bug. If the kids have digital cameras available, you can consider having photographs be a part of the challenge, so they don’t have to take things with them. Just have the kids play catch with the frisbee, or have them aim at targets or invent a game of their own. It might not even involve throwing the frisbee – they’re not bad for carrying some things. Anything from a simple sheet over a picnic table to something built using wood and tools counts. You and the kids decide how to go about it… just try to stand back and let them work when it’s something they know how to do on their own. Just keep enough of an eye on things to know that it’s more or less safe. If you have a backyard, an overnight campout is a lot of fun for the kids once they’re old enough. Set up a small tent (have them do it once they’re big enough) and have the kids bring out pillows, blankets, etc. for a night out. Remind them that bugs will go in the tent if they leave the door unzipped, but mostly let them alone. Leave the nearest door unlocked in case anyone needs to come in for some reason at night. We leave our window open so we can hear the kids too. It may only be the backyard, but kids feel really independent sleeping out of the house on their own. Why do parents have to come up with all the ideas? Let your kids go play with their friends, with as little supervision as their ages and situations allow. All this assumes that you have a safe place for them to be outside, of course. If you don’t have a good place for your kids to be out, try to find places and times where you can allow it, but don’t be too hard on yourself if things just don’t work out that way. Sometimes a great snack is all in the presentation. Fruit on a skewer can be more appealing than plain chopped fruit, even if you don’t add anything else to it. Get some bamboo skewers and slice up some chunks of fruit. Think about what will go easily on the skewers – you don’t want to stab yourself with the skewers too often, and you don’t want it to be too hard for younger kids to get the fruit off. Here’s a healthy alternative to potato chips, and many kids like them. Remove kale stems and keep the leaves. Wash and thoroughly dry kale. This is very important – damp kale won’t crisp well. Toss the leaves with olive oil. Make sure all the leaves are coated. Line a baking sheet with parchment paper. Spread leaves out on the paper in a single layer. Place in oven and cook for 12 minutes. Sprinkle with salt. Parmesan and other toppings may also work well. Take your standard apples and celery with peanut butter, and give them some style! 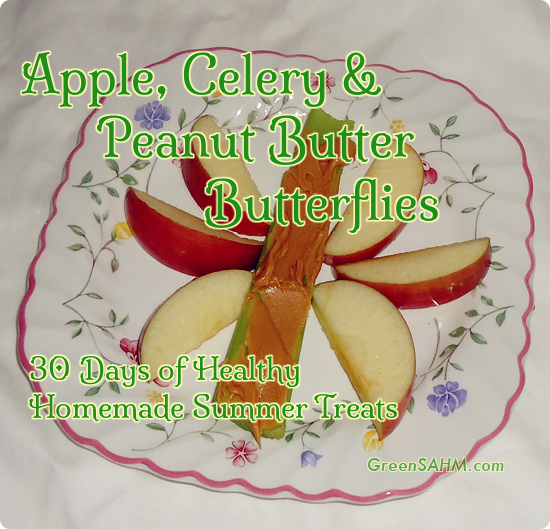 Use the celery as the body of the butterfly and set up the apple slices as wings. Coat with peanut butter, and add any toppings that sound good, such as raisins or chocolate chips. You can also use pretzel sticks if your butterflies need antenna. 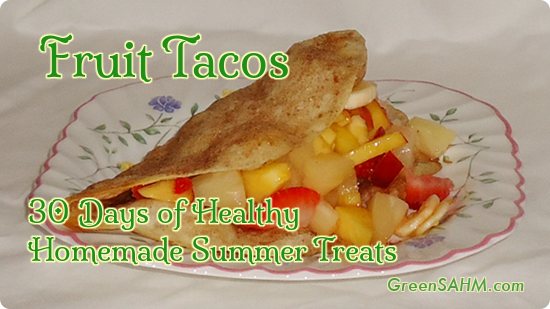 Cinnamon coated taco shells holding wonderful chopped fruit makes a really fun snack. You can also use cinnamon chips and just dip them in the fruit if that’s easier, but the taco shape is kind of fun, if potentially messy. You know how kids are. Peel, core and dice each fruit as appropriate. I’m trusting here you know how to deal with each of these fruits. You want small pieces. Mix all fruits, lime or lemon juice, and brown sugar in a bowl and refrigerate. Take one flour tortilla per person, brush with melted butter and fold loosely in half to make a taco shell. Sprinkle with a cinnamon sugar mix, inside and on top. Bake in a 350 degree F oven for 8-10 minutes. Have fun with the fruit and switch it up. You don’t have to use the same fruits all the time. Use whatever’s in season and available in your area as much as possible.